Sonic boom noise issues are different from most other aspects of aircraft noise. The potential annoyance occurs along the flight path rather than near airports. Aircraft are designed to fly at very high speeds. While they fly, aircraft generate pressure waves, or sound. These pressure waves travel at the speed of sound, about 750 miles per hour. 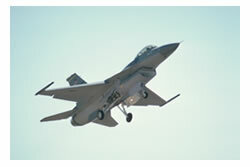 When an aircraft flies faster than the speed of sound (Mach 1.0), it creates a sonic boom. A sonic boom is a loud thunderous sound caused by a large buildup of pressure waves. The sonic boom trailing behind a supersonic airplane is very similar to the V-shaped wake a speedboat makes in a large body of water. When a jet flies by at supersonic speed, the sonic boom sound you hear on the ground is the "wake" of the supersonic jet flying by. Currently, there are no civil supersonic aircraft flying today. Are produced by aircraft flying straight and at constant speed. Are produced from maneuvering flights. Are louder and more focused. Come from sound initially traveling up and away from the aircraft and then being reflected downward to distant locations. Sound rumbly like distant thunder and can be quiet and very difficult to hear. How are Sonic Booms measured? Sonic booms are measured by the amount of peak overpressure produced. Peak overpressure is the sonic boom's largest increase in pressure above normal atmospheric pressure, about 2,116 pounds per square foot (psf). N-waves have peak overpressures from one to four pounds per square foot. U-waves can have peak overpressures that are two to five times as large as those of N-waves. However, these high overpressures are confined to a small region of the sonic boom's affected area. What Factors that Affect a Sonic Boom? Many factors control the noiseproduced and region affected by a sonic boom. One of these factors is the size of aircraft flown. Larger aircraft will create louder booms. In addition, aircraft create two shock waves when flying at supersonic speeds - one that comes from the front of the aircraft and one from its tail. For large aircraft, such as the space shuttle or Concorde jetliners, the two shock waves occur about 1/2 a second apart and can be heard as two separate booms. For small aircraft, the two shock waves occur 1/10 of a second apart and are perceived as only one boom. Sonic boom characteristics also depend on the type of flight being flown. Sonic booms produced by aircraft at low altitudes have higher overpressures and affect smaller regions on the ground. Changes in aircraft's speed or direction can either focus or weaken the sonic booms heard on the ground. Weather and atmospheric conditions may also affect the qualities of a sonic boom. The speed of sound is dependent on temperature. At lower temperatures, sound travels slower. Thus, in colder conditions, sonic booms will be created at lower speeds. Wind also affects the characteristics of a sonic boom. Because wind can move air and, therefore, sound, it can affect the shape of the sonic boom footprint--the region on the ground affected by the sonic boom. Will a Sonic Boom Cause Damage to Surrounding Structures? Sonic booms experienced by communities usually have overpressures of less than two pounds per square foot (psf). Buildings in good structural condition generally bear no damages from overpressures smaller than 16 psf. Minor damage, such as shattering of windows, may occur between 2 and 5 psf. However, this is rare. Are There Regulations on Sonic Booms? The Air Force has restrictions in place such that sonic booms be produced over water at altitudes above 30,000 feet whenever possible. When impossible, aircraft may only fly at supersonic speeds in specially designated areas as dictated by the Headquarters of the United States Air Force, Washington, D.C., and the FAA. The FAA regulations ((§91.817) prohibit civilian supersonic flight over land. Appendix B of Part 91 prescribes the application, issuance, and duration information required by an applicant when requesting for an authorization to exceed Mach 1. The FAA last issued a noise policy statement for civil supersonic aircraft in August 1994. At that time, the noise standard in effect for new type certificate applications was Stage 3. On October 16, 2008, the FAA issued an update to its policy on noise limits for future civil supersonic aircraft to reflect current U.S. noise regulations. The policy states that any future supersonic airplane produces no greater noise impact on a community than a subsonic airplane. The latest noise limit in Part 36 is Stage 4, which applies to the development of future supersonic airplanes operating at subsonic speeds. Noise standards for supersonic operation will be developed as the unique operational flight characteristics of supersonic designs become known and the noise impacts of supersonic flight are shown to be acceptable. Why are Sonic Booms Necessary? Most of today's Air Force fighter planes can reach speeds higher than the speed of sound. To increase success and survival of aircrews, it is important that pilots learn to control aircrafts at these speeds. This practice will help them operate the aircraft well in combat situations. "USAF Fact Sheet 96-03: Sonic Boom" About. 2006. 13 October 2006.